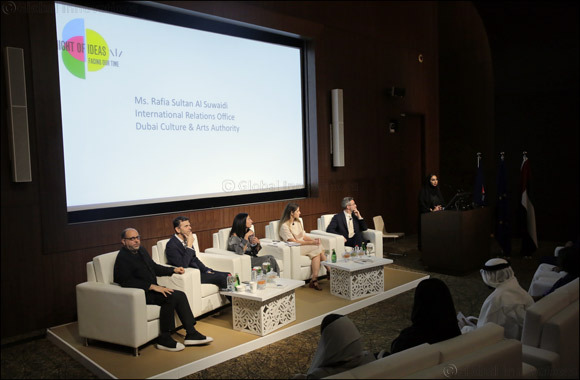 Dubai, United Arab Emirates, 3 February 2019: Dubai Culture and Arts Authority (Dubai Culture); the Emirate’s dedicated entity for culture, arts, heritage, and literature, in collaboration with the Institut Fran�ais in the UAE, successfully concluded the 2019 edition of the ‘Night of Ideas’, at Etihad Museum. The event, themed ‘Facing Our Time’, was attended by VIPs, including Sheikha Nawar Al Qasimi, Director of Development at Sharjah Art Foundation; Sheikha Noora Al Mualla; Art Centres Manager and curator of modern Arab art at Sharjah Art Foundation ; and H.E. Mrs. Raja Rabia, Consul General of France in Dubai and the Northern Emirates. For this event, Dubai Culture invited experts and dignitaries from museums and culture industry, including Dr. Noah Raford, Chief Operating Officer and Futurist in Chief at the Dubai Future Foundation; Hani Asfour, Dean at Dubai Innovation and Design Institute; Roei Amit, Director of Digital Department, at RMN-Grand Palais (France); and Lana Shamma, Programmes Manager at Art Jameel, who explored the integration of new technology and its effects on traditional showcase and curation of museums. With digital technology and artificial intelligence as central topics, the panel also discussed tech-based solutions for interactive museum platforms that serve the community with creative ideas and a futuristic outlook. The event was part of Dubai Culture's efforts to promote a mutual cultural dialogue between the UAE and France, aligned with the UAE Soft Power Strategy, and create a platform to diversify Dubai’s economy through cultural and creative industries and enable cohesion among all segments. It also contributed to elevate Dubai’s position as a leading global cultural destination and drive the cultural tourism sector in the Emirate.